Haim Ben-David at the start of the hike. Photographer: David Kennedy. Click to enlarge. 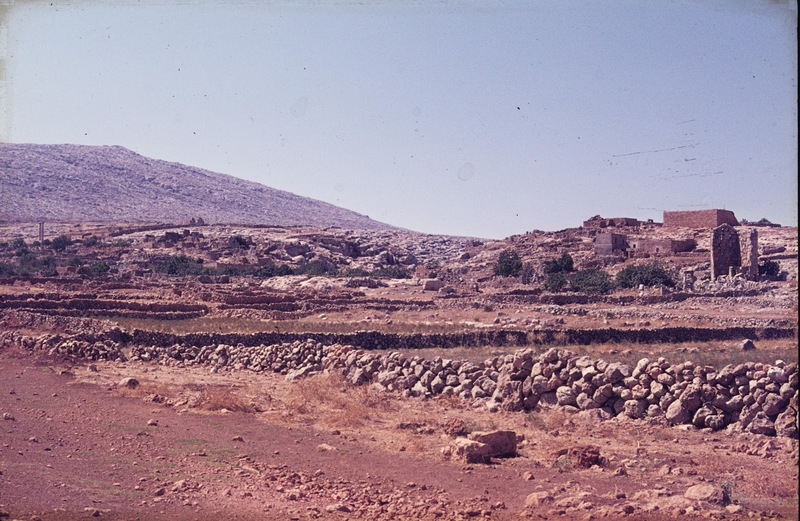 Thursday at 4 am we left Amman on a 2.5 hour drive to the point on the northern rim of the Wadi el-Hasa. 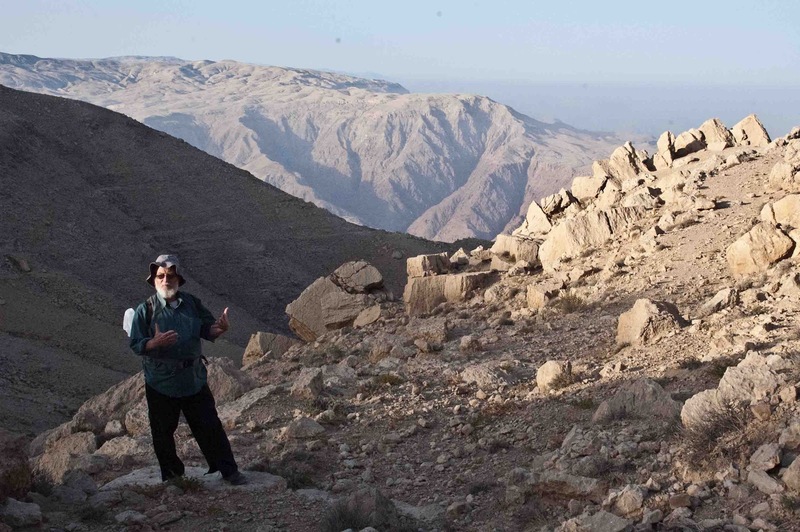 Our party of five was led by Prof. Haim Ben–David who has hiked up and down some of the more rugged parts of the escarpment overlooking the Dead Sea and Wadi Araba. 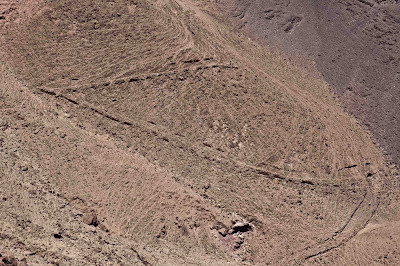 Several of these tracks follow or intersect some of the more spectacular Roman roads in the Near East. 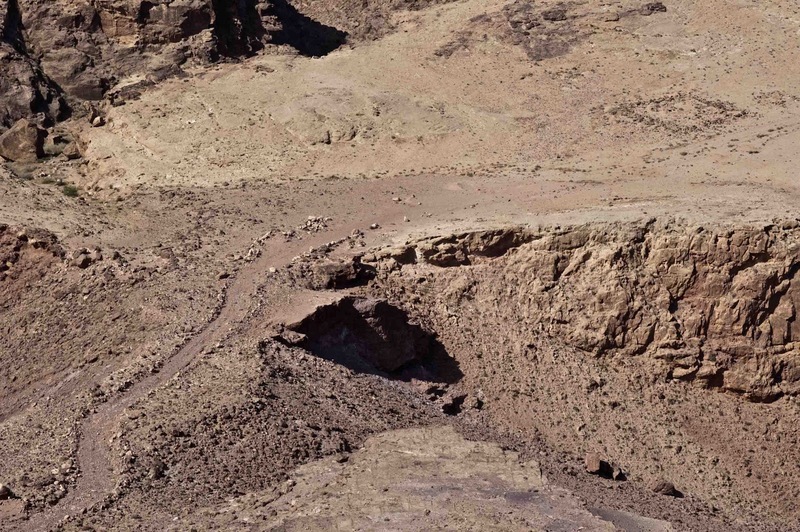 The track that starts just west of Mazar is a mixture of bull-dozed track, Roman road and footpath. In places there are traces of efforts to plough up a few of the flatter bits of ground. Most of the route is steep and rugged. The direct distance is 8 km; the actual distance zig-zagging is probably twice that. 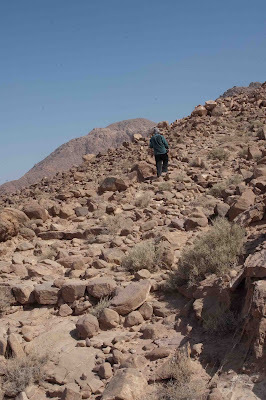 Equally important is that the hike is largely over boulder-strewn ground in which it is usually impossible to stride out – instead the hiker has to be eyes-down and carefully picking footfalls. And it is steep – a vertical drop between start and the town of Safi is about 1.3 km. A stretch of road with parallel steps. Setting off at 06.30 the start was easy and cool; by 08.15 when we stopped to breakfast in a shady place it was hot. An hour more and it was VERY hot and rising. A lot of water was drunk and I needed three coats of factor 30+ sunscreen. Haim is a skilled guide on the track and with impressive – almost incredible energy. 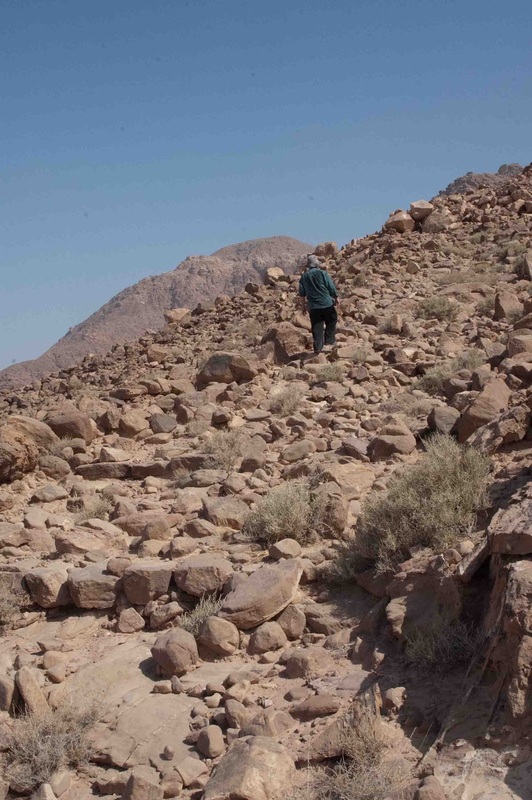 I was impressed to hear he had once walked UP the Ascent – then down the adjacent wadi the next day. By the time we were half way down and at 200 m asl I was incredulous at the thought of walking up this route. Walking down was demanding on the calves; walking up would be a challenge to the lungs. The Roman road is quite clear in places. 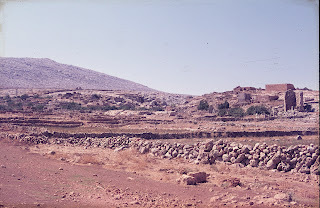 The edges are usually a double thickness of roughly square boulders about 3 m apart. In places the path between is divided up by widely-spaced steps. On sharp bends there are supporting walls. We managed to walk along quite lengthy parts of the Roman road but probably the best section is near the end where the current track is some distance away. Instead we had to view the road zig-zagging up a distant slope. 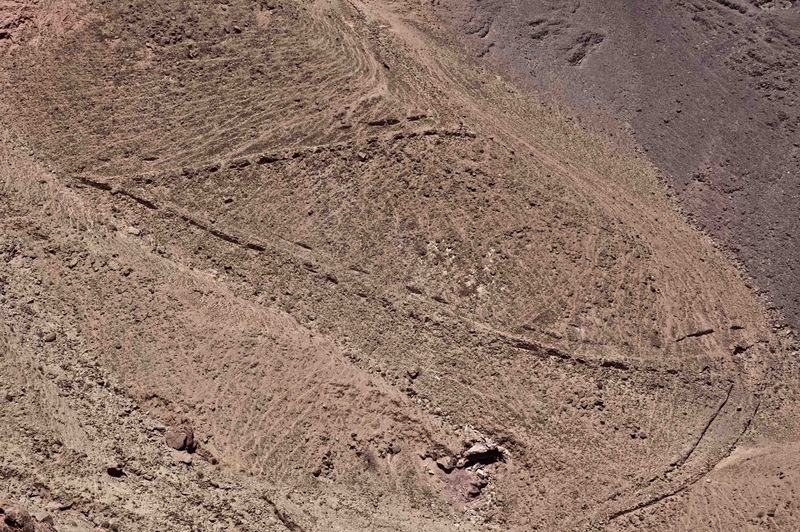 The unreachable but tempting zig-zag of the Roman road near Safi. We finally reached Safi (-300 m bsl) at 15.30. Not without tears and pain – the undersigned became jelly-legged soon after midday and found walking, much less picking a path between, on and down boulders without losing balance, ‘challenging’. Shade was almost non-existent but the temptation to sit down had to be resisted. Fortunately Haim, Yeshu and Ezer were fitter and kept me going to where the guide had driven round and was ready to meet us. A day to remember. I cannot imagine I would ever do that walk again but I would certainly like to tackle it from the bottom to walk the bit of Roman road we saw but could not reach. Our track ahead and soon to pass a fortlet on a plateau. As Haim points out, the engineering of the road implies a government agency rather than any local authority. 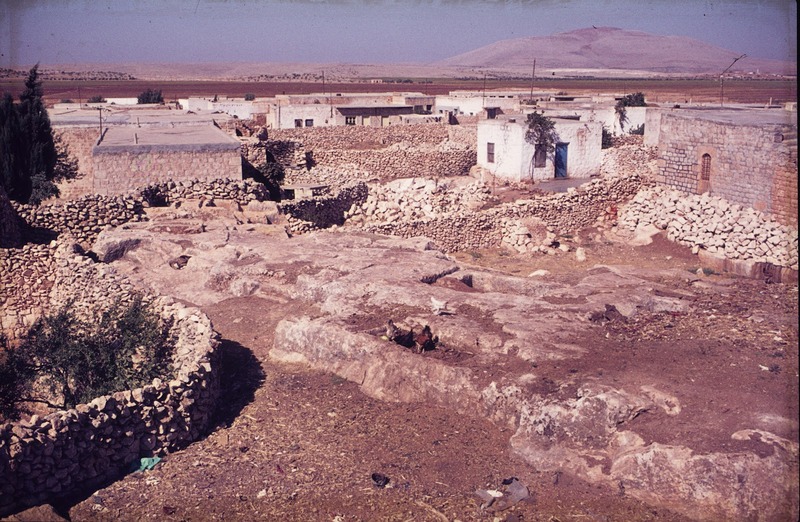 Yet there are no milestones on the road, no graffiti by exhausted traveller; there is an apparent fortlet and there are at least three open-air mosques. Pottery sherds crop up regularly along the road and they are abundant at a few places. 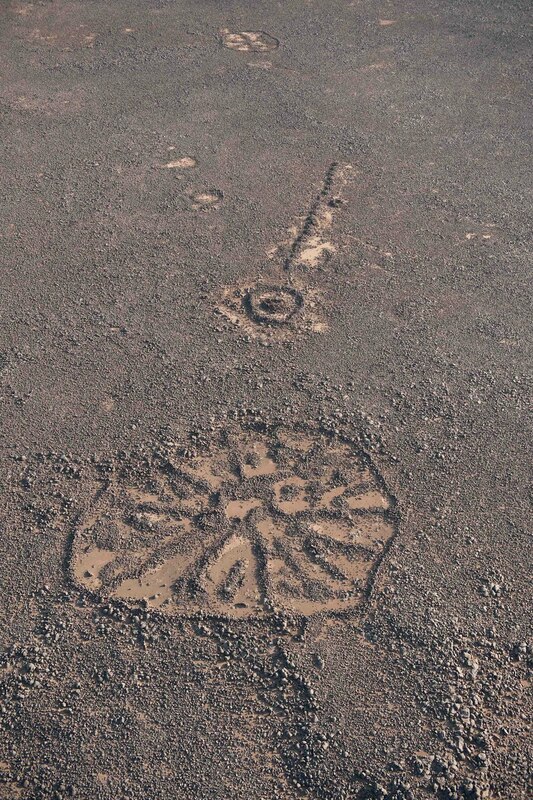 We had already photographed the fortlet from the air thanks to co-ordinates from Haim. Now we can trace the route more accurately from our GPS track and compare the landscape on the 1953 vertical aerial photos. We can return and photograph it on a future flight. More important, there is scope and a great need for some energetic archaeologist to study the road in detail – especially as parts are being destroyed. The lens of Don Boyer captures David Kennedy and Mat Dalton at work over the landscape of Jordan on Flight 20120520. David L. Kennedy 2012 'Pioneers above Jordan: revealing a prehistoric landscape', Antiquity 86: 474-491. Percy Maitland (centre) in Iraq c.1925 (Maitland Family Collection). 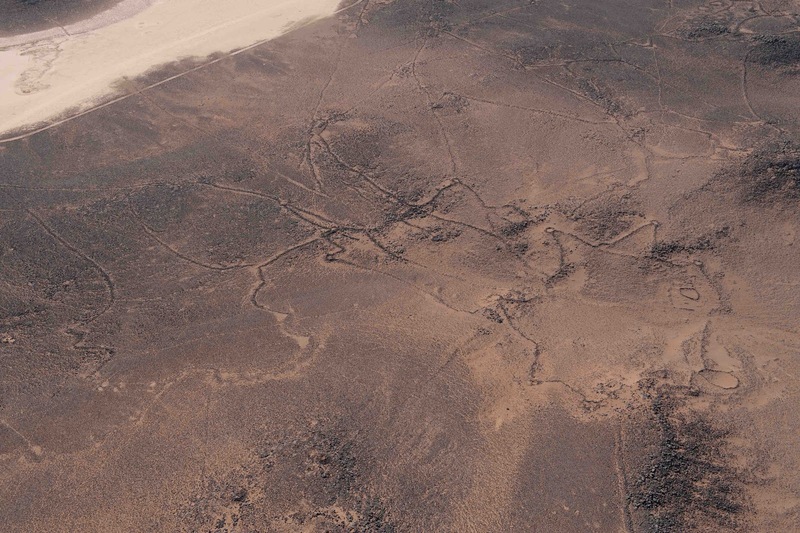 Aerial photography is so fundamental an instrument of modern archaeology that we often take it for granted. 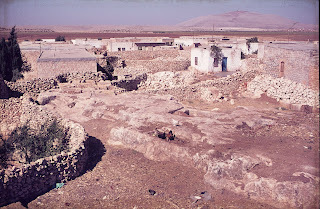 But its methods are surprisingly specific and its most important experimental theatre was probably the territory of the Levant—and especially the rocky terrain of Jordan. 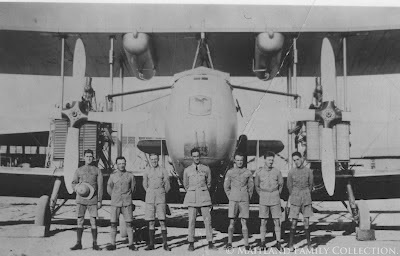 The author, a prominent aerial archaeologist of our own day, takes time off to review the achievements of the pioneers, serving officers who established routes over the desert to deliver mail between Egypt and Iraq. The fabulous ancient landscape they discovered could only be appreciated through the lowlevel window provided by these slow-moving rickety machines and their intrepid pilots. In these days of jet travel, the precious basalt landscape is in danger of slipping off the agenda again—both for researchers and conservers. 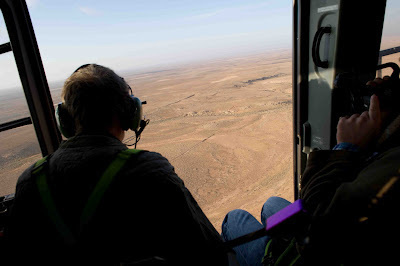 APAAME_20120522_DLK-0095. Photographer: David L. Kennedy. Click to enlarge. 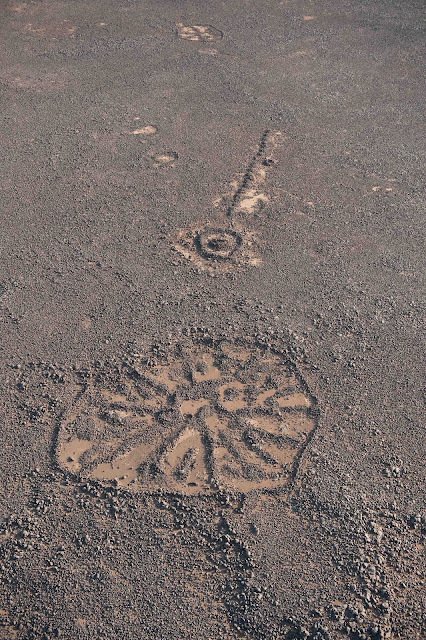 Fantastic example of a Bullseye Pendant, with a tail constructed of small cairns, and a Wheel, with spokes radiating from a central 'hub'. Our first flight got off to an early start (take-off at 06.10). 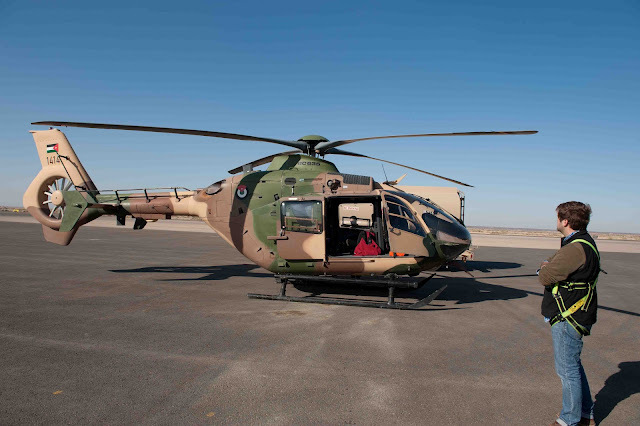 With no Huey available we were squeezed into an EC 635 (Eurocopter). It is much more comfortable, easier to move around in, quieter and the headsets all work and are much clearer. On the other hand ... too small for our team, a narrow door with just room enough for two, seats set at right angles so we had to climb down and sit on the floor with our legs dangling out the door. Otherwise it was a very successful flight and the pilot - new to the job, soon picked up on our needs and was very skillful. After 4 hours he had had enough twisting and turning however - neither he nor the co-pilot had had breakfast, he had a headache and it was a safety issue. Hard to argue with. We will ensure we all have breakfast with us next time ... and Panadol. The 20120520 team. Photographer: David. L. Kennedy. It was a day for Kites (again). Quite a contrast between the simple Kites west of Azraq in the first stretch and the amazingly complex one later to the east. Time now to download, catalogue and prepare for the second flight on Tuesday. Ausaji Kites 53 (left) and 54 (right). 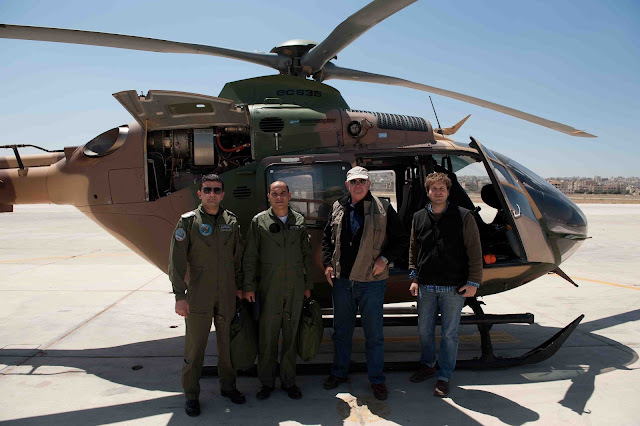 APAAME_20120520-DLK-0285. Photographer: David L. Kennedy.